RAM - A 512KBytes SRAM. The interesting thing is that the CPU can't directly access the frame buffer. The reason I have done this is due to the result of the testing I did in my previous post. It appears that the GPU is going to monopolise the bus just to clear the screen. I worked out that if the GPU was in a fact a 16MHz ATMega328 (same as Arduino Duemilanove), then just clearing the screen at 60 FPS would consume 97% of the CPU time and as a consequence a similar proportion of the bus bandwidth. Now, my GPU will run at 20MHz and I'll probably refresh at 50Hz since but the situation is still pretty dire. So, the direction I'll take will be to separate these buses. 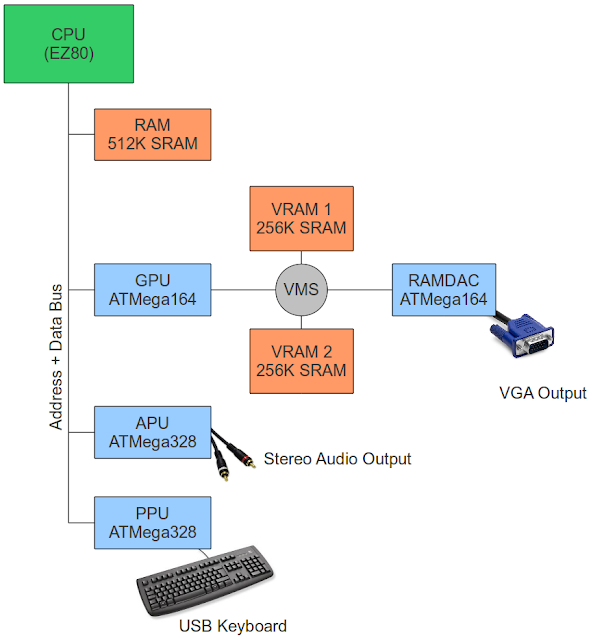 The CPU will just write commands to the GPU over the Main Address/Data bus and the GPU will render to the VRAM. This means filling single pixels is going to be much slower but other operations like solid fills should be much better. There is a potential problem here. I probably don't have enough pins on the GPU for two address and data buses. I'll need to work something out here. I have an idea involving overlapping address spaces and tri-state data buses. More to follow.